Stormwater education and outreach efforts by an MS4 or a NGO that are effective in changing specific resident behaviors and actions that generate stormwater pollution in the community and goes well beyond the minimum management measures for stormwater education and public involvement required in their MS4 stormwater permits. Below you will find information about the winners of the Best Education and Outreach Program category of the 2017 BUBBAs. The town of Edmonston has a population of 1,500 residents, approximately 48% of whom are Latino, and 35% of whom are African American. Prior to the construction of a new community green street, the town hosted a series of three bilingual (English/Spanish) charrettes to receive input on the project design. Following the charrettes, inspired community volunteers planted three edible forests using native fruit trees, also selected by community members, similar to those found in Central America and Mexico. Planting and care instructions, printed in both English and Spanish, were provided to participating homeowners as part of this successful campaign. To read a full project narrative and view more photos, please visit the project folder on our Google Drive. 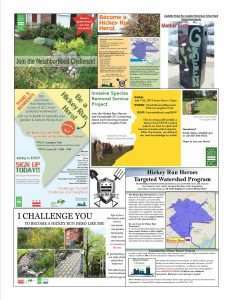 This multi-pronged outreach program, with the goal of reducing stormwater runoff in the community, incorporated a competition to increase participation in the RiverSmart Homes program, the creation of a local advocacy group, the distribution of rain barrel art, several community events, as well as print and digital communication tools in order to promote the Hickey Run Heroes Program. Participation in the program more than quadrupled between 2013-2015 as a result of these efforts. Artists: Henry Marnghitr, Lauren Lawrence, Sara Moline, Gaya Iyengar, Asian American LEAD – Julius West Middle School. The City of Rockville partnered with VisArts, a local art nonprofit, to solicit storm drain mural designs from local artists and pain murals on five, highly visible storm drain inlets in the city’s Twinbrook neighborhood. 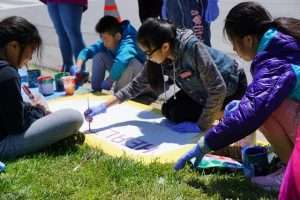 The project culminated with a walking tour for community members to join the artists and learn about the inspiration behind their murals as well as encourage conversations about pollution prevention and healthy streams. 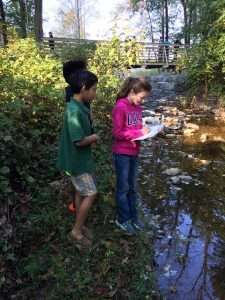 More than 350 students from seven schools within the Fairfax County Public Schools system participate as citizen scientists to help staff monitor floatables in and adjacent to their local streams. Three out of the seven schools are designated as Title I schools. The sites for the floatable monitoring program span multiple watersheds and create a monitoring network across Fairfax County. Staff provide an introductory presentation to the program, data collection training and assistance with field monitoring.